It’s been two weeks now since my last full “”weekly highlights” post. Last Friday and Saturday I was attending our state’s homeschool conference, and by the end of the weekend I just wasn’t up for trying to remember all that we had done the week before. 🙂 So…now I have to try and remember what we’ve done for two weeks! We’ve had some crazy weather, that’s for sure! Maybe now we are finally done with snow, and can move on with actual spring. We are all so ready for nicer weather! Today (the first day of truly warm weather so far this spring),we did a very minimal amount of school work and did some “fun” errands (including a book sale…I love those! ), and spent time outside. 3. Mr. E (Age 6, Kindergarten) has been working on beginning multiplication and on learning to tell time to the minute in RightStart C.
4. In Logic of English Foundations, Mr. E is up to Lesson 103. In the picture he was working on a “silent E sort” — deciding the reason for the Silent E in a variety of words. Miss M (Age almost 9, 3rd grade) finished Lesson 33-34 of LoE Essentials in the past two weeks. This week she had a perfect score on the end of lesson test! 5. – 7. The past two weeks Mr. K (age 4, Pre-K) has been very into mazes, coloring create-your-own Lego Mini-Figures (I don’t know why I haven’t printed these out before…I guess I kept forgetting! I think about a dozen of these were colored by the two boys this week! ), and lots of pretend play, of course. 8. Mr. J (18 months), has been into making messes, of course! 9.-10. Mr. E finally got to do his Lego Star Wars expert day presentation at co-op (it was postponed from earlier this month when co-op was cancelled due to bad weather). He did an awesome job! 11. Miss M is in the drawing/geometry section of RightStart D. She doesn’t love it as much as she did when we did similar lessons in RightStart C, and she is amazed that I don’t always know exactly how to draw the figures (the manual does not give step-by-step instructions). I keep reminding her that until the drawing/geometry in RightStart C, I had never even used a triangle or T-square! 12. After being very interested in Robins and reading a number of books about them, Miss M decided she wanted to make a lapbook about Robins. She worked on that over the past two weeks and finished it up today. I’ll give that the attention it deserves in it’s own post sometime next week! Have a wonderful weekend…we’ll be out enjoying our lovely warm weather!!!! 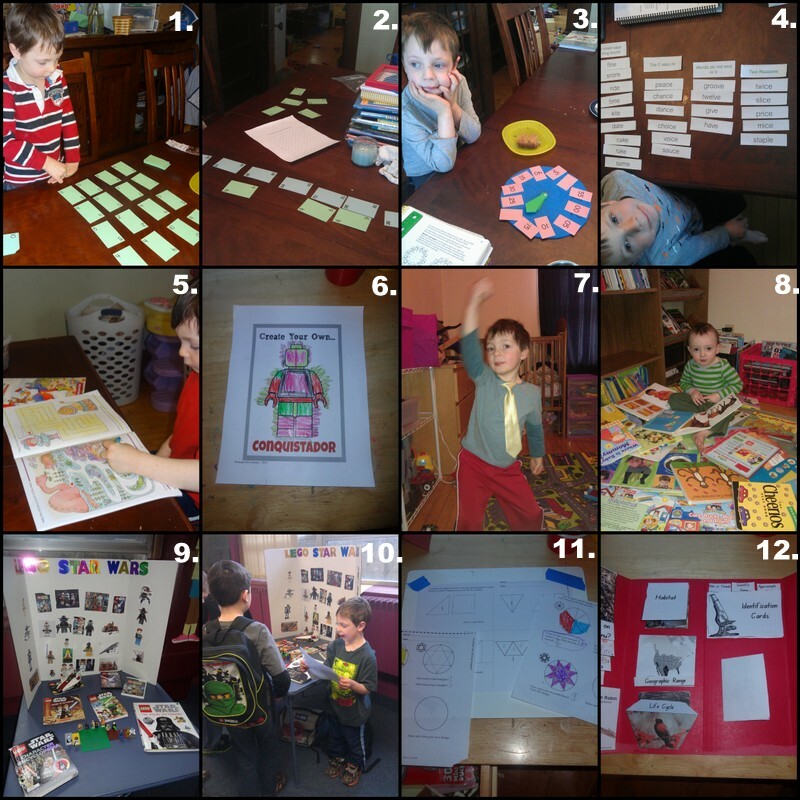 I’m linking up with Collage Friday, The Weekly Wrap-Up, and The Homeschool Review! As we wind down our school year and with it, our US History studies for the year, I wanted to do one high-quality read-aloud set in the Civil War time period. From a short list of Civil War novels I considered, Rifles for Watie by Harold Keith stood out for several reasons: It won a Newbery Award in 1957, it was a book I remember my step-Dad telling me was very influential to him, and some how I don’t think I had ever read it before. Despite being exposed to many documentaries about the Civil War growing up, I think the only book I read on the topic was Across Five Aprils. Rifles for Watie follows the story of Jeff Bussey, a teenager from Kansas who decides to enlist in the Union army. He is sick and tired of the “bushwackers” (pro-slavery men from Missouri) who cross the border and attack Kansans who are anti-slavery, and he figures that joining up to fight in the war is the only way he can really do something about it. Although at first he misses out on actual fighting (and also gets on the bad side of his commander in the process), he eventually is involved in several battles, first in the infantry, then later in the cavalry and even as a scout. This book is set in the western front of the war. Bussey and his comrades fight in Missouri, Arkansas and what is now Oklahoma. While out on a scouting mission, he finds himself in an unusual situation — a remark by his partner on the scouting mission finds them joining up on the Confederate side with Stand Watie‘s Cherokee Mounted Rifles. For months he plays the part of a rebel, waiting to find out some important information before returning to the union side — and he discovers how surprisingly likeable both soldiers and civilians on the enemy side really are. Rifles for Watie is quite a long book. At 352 pages of small type (in the edition we checked out from the library), it took us close to three weeks to finish it! But our patience in making it to the end of this book was well worth it. I would say the most exciting part of the story is the final few chapters of the book, when Jeff is embedded as an impromptu spy with the Confederates. Much of the story gives a sense of the reality of war for the soldiers (lots of waiting, travel and boredom with a few battles thrown in), as well as of the horror of war without being too graphic. We also liked how Rifles for Watie gives the reader empathy for both sides, and for people groups often overlooked in other books about the Civil War, like members of various Native American tribes. Overall I would say this is a great choice for mid to upper elementary as a read-aloud set in this time period, and is probably enjoyable as an independent read in middle school and up. I missed my usual Friday (or Saturday) wrap up post for this week, because I was furthering my education as a homeschooler by attending the annual MACHE conference in Rochester, Minnesota. MACHE is the Minnesota Association of Christian Home Educators. I’ve attended the conference two previous years when it was held closer to my home in St. Paul, MN. But this was the first time I made the conference more of a getaway. I went to Rochester with two friends, and we shared a hotel room on Friday night and enjoyed our fun dinner out and staying up late chatting about what we were learning at the conference. Good times! I enjoyed hearing several informative and entertaining speakers, browsing curriculum, and making a few purchases (nothing too major or exciting this year!). The kids got the thrill of daddy being their “substitute teacher” on Friday while I was gone. 🙂 I’ll wrap up last week and the upcoming week at the end of this next week. Yes, that’s another 6.5 inches of snow. Luckily most of it has already melted. But things are still very not-spring-looking outside. 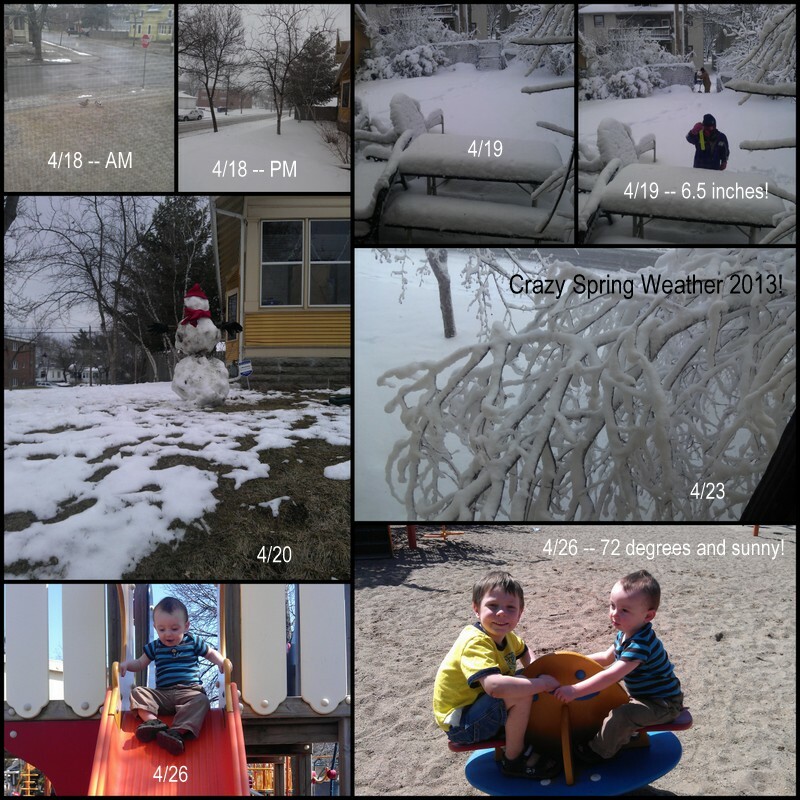 With our unseasonably cold weather, it is hard to believe that the end of our school year is fast approaching. We have three “regular” weeks of school, then we have our “testing week” (MN is a state that requires annual standardized testing, and we will test over three days with our co-op), and our last week of school (which is made unusual by Miss M’s birthday, a final co-op meeting/picnic, and preparations for a Memorial Day weekend trip out of town). Of course, learning never has to “end” even when we take a summer break. (Though one wonders if even at the end of May if the weather will still only feel spring-like…or if we are just going to skip spring this year and go right into summer weather!). This summer we’ll review math facts, the older two kids will learn typing, and we’ll study some Minnesota history. And then we’ll start adding subjects back in sometime in July. I’m linking up with Blogging Through the Alphabet at Ben and Me! It looks like I’ll be about the 50th blogger to link up for the letter “E”. Wow! Head over there to see what other bloggers have thought up for this letter. Once every couple of months I try and share tidbits about some of the pictures books we find at the library. Since Miss M and I are still in the middle of a very long read-aloud about the Civil War, it seemed like a good week to do just that. A little over a week ago we took a trip to the Minneapolis Central library branch downtown. Among their large collection of picture books, it’s always easy to find books by beloved authors and illustrators – including older books that may not be on the shelf quite so often at our neighborhood branch. Lois Lenski has a special place in my heart as an author/illustrator–mainly because she illustrated the first four books in my all-time favorite children’s book series, the Betsy-Tacy books by Maud Hart Lovelace. We own a couple of Lenski’s picture books, but there are many of her picture books we haven’t read yet. I found a few of her “Mr. Small” titles on our trip to Central Library. I read “Policeman Small” to the boys at bedtime last night. Tony was out, so I was pulling bedtime double-duty of reading to the boys and to Miss M. Everyone enjoyed the rhythm of this old-fashioned story of a traffic officer’s day and all the people and vehicles he sees. I was actually just thinking the other day about what city life was like before traffic lights – I’m sure there must have been a lot more traffic police men doing what Policeman Small was doing in this book. J He has a great “manual” version of a stoplight, in a manner of speaking (it’s two “stop” signs and two “go” signs on a pole that can be rotated so one faces each side of a four-way intersection). I’ve never seen a picture of one of these before, but I would have to imagine these were actually used in the days before stoplights. Here’s another little tidbit about this book I found completely fascinating. Policeman Small actually opens with “sheet music” for a song about the book’s namesake character. The words were written by author/illustrator Lois Lenski, and the music appears to have been written by none other than prolific children’s book author Clyde Robert Bulla. I had no idea he was a composer as well. We’ve read and enjoyed several books by Bulla. I Don’t Want a Cool Cat. A favorite of both boys, who liked the clever and funny descriptions of all kinds of cats that a girl does not want for a pet. Dirtball Pete. A sweet story about accepting someone for who they really are – even if that means they are covered in dirt! Knit Your Bit – This World War I-era story is another recommendation from Amy that we all enjoyed. I wasn’t sure if the boys would really be “into” it, but they liked it enough to request it to be read to them more than once. 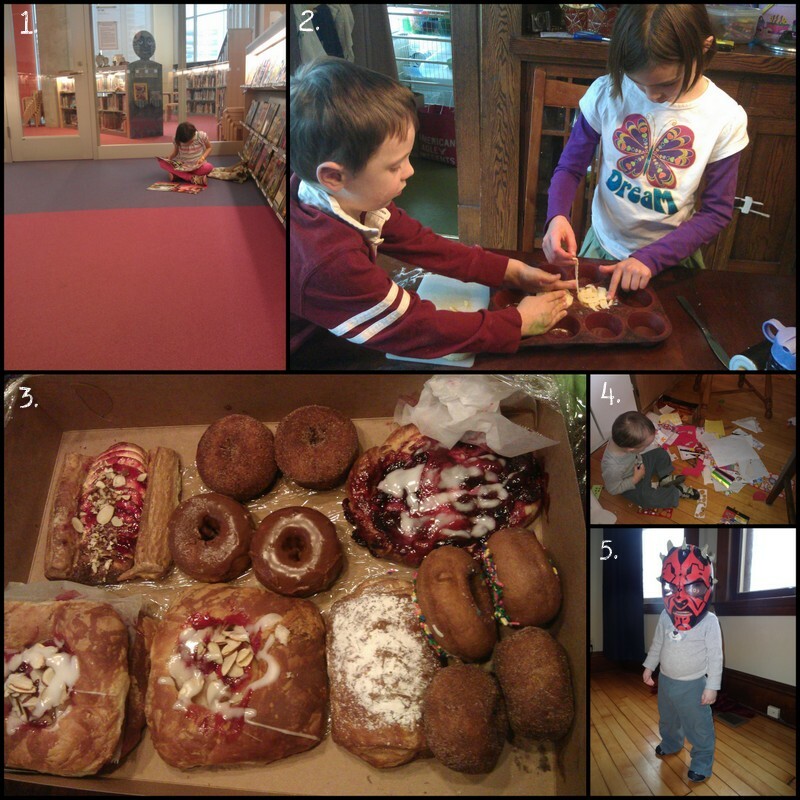 The Great Doughnut Parade – this was another favorite of mine that the boys liked as well. Mr. K (age 4) asked many, many times if he could REALLY tie a doughnut to his pants with a string after reading this book. Two Sticks – A girl with a love for drumming drums her way out of a jam in a swamp full of alligators. This was a favorite with Mr. E (age 6). Wumbers. I feel like I heard about this one from another Read Aloud Thursday post at some point, but I am not 100% sure. This is a puzzle picture book where the pun-like puzzles come in the form of numbers melded with words. I love books like this, and Miss M really enjoyed it too. I always find word-play picture books to be not quite as fun as I wish they would be with the boys though, since I have to explain so many of the jokes! I also just realized that this book is by the same author of a picture book we really enjoyed a few months ago, This Plus That: Life’s Little Equations. What Can a Crane Pick Up? A classic “truck” book, I heard the boys repeating lines from this book over and over again after we read it. I attend a monthly “homeschool moms support group” with ladies from my church. We have small prayer groups, have discussions or guest speakers on various topics, and usually someone shares a short devotion with the group. This year, the 5-10 minute devotional for each month was supposed to be on a character trait we were learning about or working on with our children. Last fall, I signed up for this month’s devotional slot with the idea that we would, by now, have learned so much as a family about various character areas. After all, I was armed for the year with resources to really make “character study” a priority. Although many moms selected a character quality to speak about when they signed up, I didn’t choose one ahead of time since I assumed I might like to pick the best from what we studied this year. Now it’s time for a reality check. I bought a Bible study on Proverbs months before our current school year started. But after a couple weeks of use Miss M, my third grader, thought the “fun” word puzzles were stressful, and just couldn’t wrap her mind around the idea of reading the same verse or short passage several days in a row. She said, “That’s crazy, mom!” So, the Proverbs Bible study was put on the shelf to save for another year. It’s a great product — just not the right thing for her right now. I thought the “We Choose Virtues” cards were so cute when I saw them on various homeschooling blogs I read. Each character quality or virtue has a “kid” that represents it, along with a verse and a catchy phrase. But, always looking for the frugal option, I bought a small version of the cards (the flash cards) not realizing that this size of card didn’t have any instructions or ideas for teaching about the virtue like this bigger version did. I just couldn’t really make very good use of the cards, so most of these small cards got lost in the mess of our school room. Again, a great product (especially if I would have had the larger cards with teaching ideas), but the reality was different than the dream. At a conference last year I bought a few resources from Doorpost books. Just like the “We Choose Virtues” program and the proverbs Bible study, I think these are great resources too. I bought a couple things we decided just weren’t quite the right fit for us, but I was really excited about this Bible study in particular about various qualities we can “put on” from Colossians 3. But, when I actually tried to present this material to the kids, it was a bit of a flop. I don’t think this is the book’s fault – probably more my lack of skill in the style of teaching it required, or the place I tried to fit it into the schedule. But, whatever the case, despite how much I liked the material, it just didn’t get done. So, when I realized a few weeks ago that this devotional talk was looming over my head, all I could think of were the negative character qualities I have seen my kids exhibiting. I’m sure this never happens in your homes, but I just thought about all the ways my kids think of themselves instead of their siblings or of others. All the times my kids yelled or hit or threw a toy at one another in anger instead of using words to work out their conflicts. All the times my kids whined and complained or even screamed and threw a fit about schoolwork or chores. And then there is my lack of character growth to consider. I thought about all the times I got angry with my kids or lost patience with them as they did all of the above and more. I thought about all the times I chose laziness or fear or complaining instead of hard work, trust and joy. And I seriously considered backing out on sharing tonight. I know that God does not view me or my kids through a lens of failure. His grace abounds. But what wisdom do I have to share? 7Dear friends, let us continue to love one another, for love comes from God. Anyone who loves is a child of God and knows God. 8But anyone who does not love does not know God, for God is love. 9God showed how much he loved us by sending his one and only Son into the world so that we might have eternal life through him. 10This is real love—not that we loved God, but that he loved us and sent his Son as a sacrifice to take away our sins. 11Dear friends, since God loved us that much, we surely ought to love each other. 12No one has ever seen God. But if we love each other, God lives in us, and his love is brought to full expression in us. 13And God has given us his Spirit as proof that we live in him and he in us. 14Furthermore, we have seen with our own eyes and now testify that the Father sent his Son to be the Savior of the world. 15All who confess that Jesus is the Son of God have God living in them, and they live in God. 16We know how much God loves us, and we have put our trust in his love. God is love, and all who live in love live in God, and God lives in them. 17And as we live in God, our love grows more perfect. So we will not be afraid on the day of judgment, but we can face him with confidence because we live like Jesus here in this world. 18Such love has no fear, because perfect love expels all fear. If we are afraid, it is for fear of punishment, and this shows that we have not fully experienced his perfect love. 19We love each otherb because he loved us first. As my kids fight with each other or refuse to do their chores or act selfishly, I’ve been trying to bring it back around to love. Do your actions show love toward your brother? What would be the most loving thing to do in this situation? How can you go out of your way to show love to someone else right now? Can you ask God to give you Spirit-filled help to love this person right now? I know I can tend toward being a “box checker” spiritually, and it wouldn’t surprise me if some of my kids had personalities that tend in that direction too. There are a lot of good things about character curriculum products, but I could see how they could also lead us to feel like we had “checked off a box” of patience or honesty or diligence because we memorized a verse and catch phrase and completed an activity. I’m not sure what we will do in future years to help our kids grow in character in terms of using a curriculum or Bible study, but at least for the moment, I’m feeling like we can’t go wrong with asking ourselves and our kids, “How can we show love in this situation?”, and praying for the kind of love that we can only have with God’s help. We had a few unexpected happenings this week…. 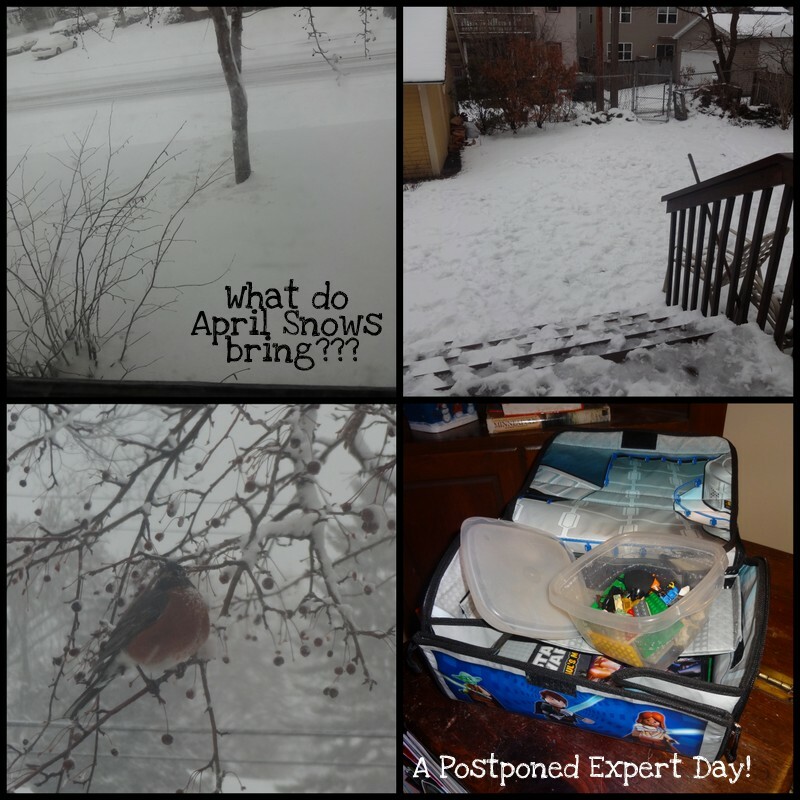 Yes, we got an April snow storm. The forecast was for such vast quantities of snow that the building our co-op meets in preemptively planned to be closed on Thursday, the day our co-op meets. 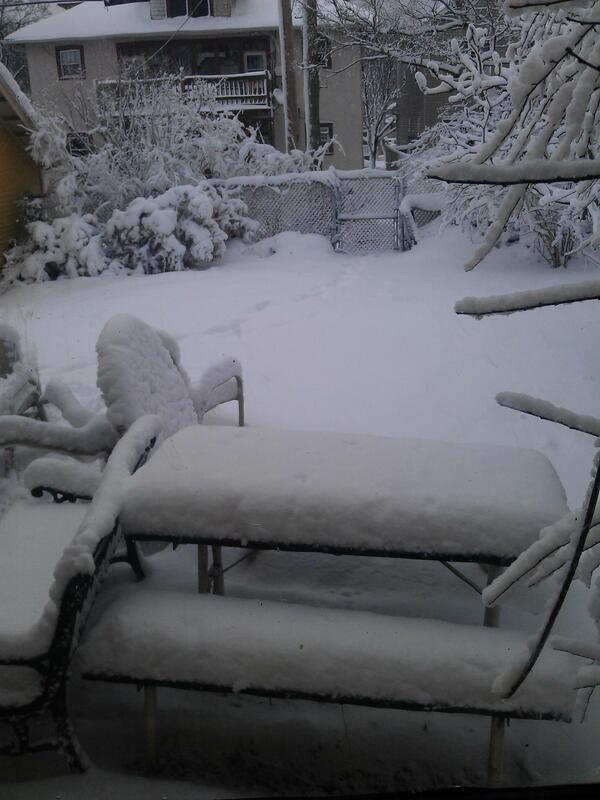 So even though we got nowhere near the foot of snow the forecasters said we might get, we still had no co-op. And the roads in our metro area were definitely icy. So, Mr. E’s Star Wars Lego collection was all packed up with no where to go. He will do expert day later this month instead. 3. For math this week, Mr. E (Age 6, Kindergarten) continued to review 2 digit addition with Right Start C. We also hit the lessons with making groups from stars on the flag (pictured) and grouping the dots on a Chinese checker board. He wasn’t so keen on these activities. I think this is where his young age for the book comes through — he barely had the patience for the flag, and didn’t have the patience to finish the checker board activity. I bet it will be a much different story when we hit the checker board again at the end of C (since that will be about a year from now!). Miss M practiced two digit by two digit multiplication in RightStart D, and did some multiplication and division word problems. We’re kind of skipping around at this point…next up for her are the drawing lessons at the end of D.
For math games this week, we played Speed (both M and E), Skip Counting Memory (Game P2, both kids), and Find The Two Factors (game P29, just Miss M). 4. For History and Science we took a few “Rabbit Trails” in our book basket. We’re studying the Civil War for history, but we spent some time this week zeroed in on a topic of interest — a confederate submarine called the Hunley (Read my post from Thursday to find out about a book that inspired this rabbit trail). In the science basket, we now have books about backyard birds, as well as books for the unit I planned on Simple Machines. Miss M told me she was really into Robins right now (we have one, pictured in our top collage, that hangs out in one of our trees quite a bit) and wanted to learn more. So, we found one book devoted to robins, a few books about other birds we have in our yard, and a few books about backyard birds in general. 5. For Spelling/Phonics this week, Mr. E completed another five lessons of Logic of English Foundations (he’s up to lesson 95 — it’s hard to believe there are only about another 20 lessons left in terms of what is currently written…he’s almost all the way through!). He liked the assigned reading of “The Foot Book” and also continued with the next chapter of the Little Bear book he started reading last week. Miss M worked on lesson 32 of Logic of English Essentials. This wasn’t her best week testing-wise, but at least most of the mistakes were small ones. 3. It was my birthday on Tuesday. We enjoyed these yummy pastries from my favorite bakery for breakfast (and snack, and breakfast the next day). We didn’t do a lot of special things on the day of my birthday, but Tony did bring me flowers and made us a yummy dinner and dessert! 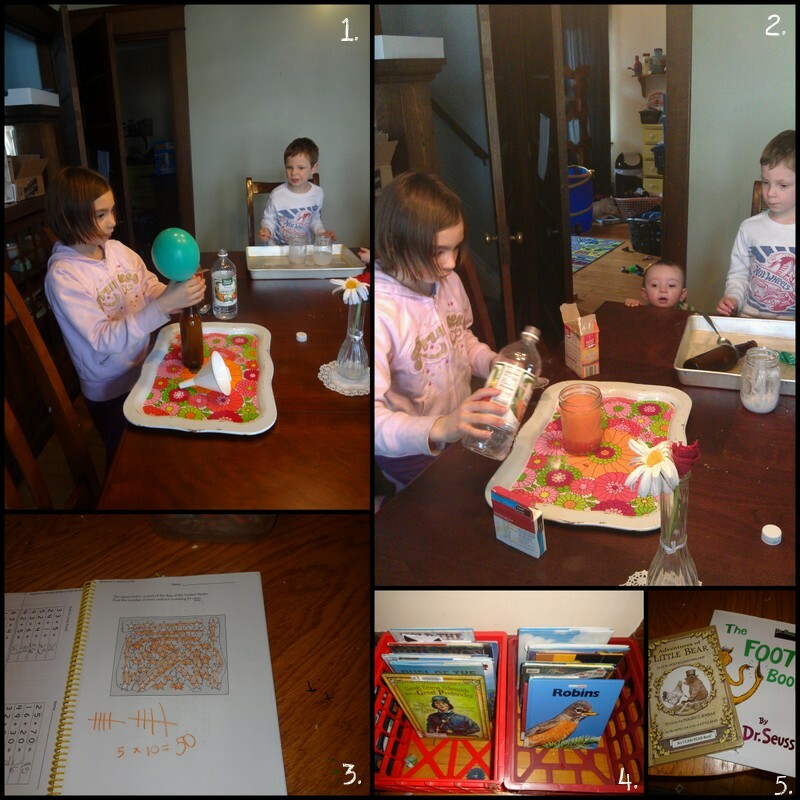 I’m linking up with Collage Friday, The Weekly Wrap-Up, and Homeschool Review!